Gold was first discovered at Walhalla in 1863. Alluvial gold was worked first and from 1864 larger companies started bringing in stamper batteries to work the reefs. Walhalla's Cohens Reef became the richest gold-bearing reef in the world. The town's population peaked at 4,500 between 1885 and 1895. There has been a cemetery at this site since at least 1866, although Walhalla Cemetery was not temporarily reserved until 1873 nor permanently reserved until 1894. 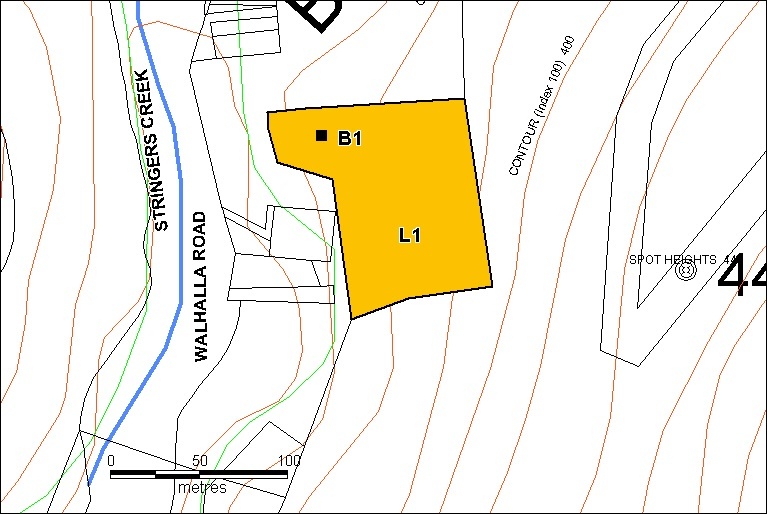 It has been enlarged in size several times and now comprises 1ha prominently sited on a steep hillside on the eastern side of the Walhalla Road and Stringers Creek at the southern end of the Walhalla township. Access is gained via a meandering track up the hillside. 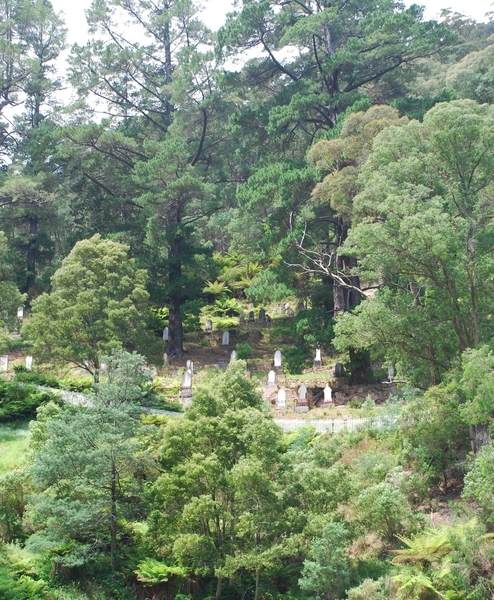 The cemetery is surrounded by bushland consisting of predominantly eucalypts and acacias while within the cemetery itself aged Pinus radiata dominate. Other conifers and smaller exotic trees are present in lesser numbers. In 1884, trees and shrubs from the Mt Macedon Colonial nursery were planted at the cemetery, and more again ten years later. A large Bhutan Cypress grows from the top of one gravesite. The picket fence that encloses the cemetery to the west and north replaced an earlier fence in 1984. The stumps of original fence posts can still be seen along southern boundary. Close to the main entrance is the Sexton's Office, built in 1886. 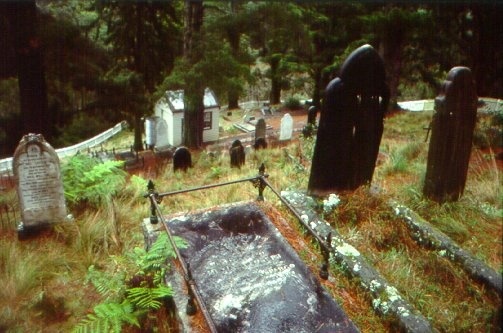 The main cemetery paths run parallel to the slope, terraced by dry stone walls with access to graves by paths and stone steps running in various directions. A total of more than 1,100 people are known to have been buried in the cemetery, although less than 200 graves can now be located. Headstones vary between white marble, unpolished grey slate with cast-iron fences, timber memorials and timber picket plot-fences. Many graves are marked by modern timber pieces nailed together to form a T.
Many of Walhalla's leading residents are buried in the cemetery in clearly marked graves. Most notable are Lewis Loan, owner of the Star Brewery in Walhalla, and Henry Dendy of Brighton. Dendy, the purchaser of the Brighton Special Survey in 1841, became a shareholder of the Thomson River Copper Mining Co in the 1870s and died in the town in 1881. Walhalla Cemetery is of historic, social and aesthetic (landscape) significance to the State of Victoria. Walhalla Cemetery is historically and socially significant as tangible evidence of the former status of Walhalla, one of the most populous nineteenth century Gippsland towns, and one of the most prolific gold producing towns in Victoria. The cemetery represents, by virtue of the majority of its burials before the First World War, the gold mining population of the area. There was no life after gold in Walhalla. Cemeteries are sometimes the only tangible evidence of earlier communities. Walhalla Cemetery is aesthetically significant for its steep topography, which demanded a unique layout of parallel paths, terracing and dry stone walls, in contrast to the more favoured formal layouts characteristic of contemporary cemeteries on flat land. The exotic plantings are characteristically sombre and melancholic. The magnificent large and mature coniferous trees dominate the cemetery and the dark foliage and formal shapes are in contrast to the bush setting. Pine and Cypress trees were favoured trees in cemeteries for their symbolic associations. 2. All the land known as Crown Reserve RS8691 permanently reserved for a cemetery within the area marked L1 shown on Diagram 1976 held by the Executive Director. General Conditions: 1. All exempted alterations are to be planned and carried out in a manner which prevents damage to the fabric of the registered place or object. General Conditions: 2. Should it become apparent during further inspection or the carrying out of alterations that original or previously hidden or inaccessible details of the place or object are revealed which relate to the significance of the place or object, then the exemption covering such alteration shall cease and the Executive Director shall be notified as soon as possible. General Conditions: 3. If there is a conservation policy and plan approved by the Executive Director, all works shall be in accordance with it. General Conditions: 4. Nothing in this declaration prevents the Executive Director from amending or rescinding all or any of the permit exemptions. Nothing in this declaration exempts owners or their agents from the responsibility to seek relevant planning or building permits from the responsible authority where applicable. * Interments, burials and erection of monuments, re-use of graves, burial of cremated remains, and exhumation of remains in accordance with the Cemeteries Act 1958 (as amended). Continuation of burials and erection of monuments as approved by the Cemetery Trust. * All works described in Chapter 4.0 Recommendations Walhalla Cemetery: Landscape and Management Study, J Hawker Royal Botanic Gardens, 1986 are permit exempt. The purpose of the permit exemptions is to allow works that do not impact on the significance of the place to occur without the need for a permit. Repairs and maintenance which replace like materials with like are permit exempt. J Hawker Royal Botanic Gardens Walhalla Cemetery: Landscape and Management Study, 1986 provides comprehensive management guidelines for Walhalla Cemetery. The management recommendations contained in chapter 4 of that report should form the basis of permits policy for the cemetery. The Cemeteries Act 1958 (as amended) guides the Cemetery Trust on matters of burials and erection of monuments.